What fabulous book cover this is. I’d buy the book purely on the strength of the picture – in fact I just have. The image is a 1901 poster for the British Mutoscope and Biograph Company, taken from the copyright collection of The National Archives. Biograph’s 70mm films were a special feature of the Palace Theatre in London (still active today, currently showing Spamalot), and Biograph programmes generally featured news items – hence the full slogan on the screen (which is obscured on the book cover), ‘The Biograph Reproduces the Latest Events from All Parts of the World’. But the book within is no less of a treasure. The subject of The Haunted Gallery: Painting, Photography, Film c.1900 is how the moving picture changed visual culture at the end of nineteenth century. Lynda Nead is an art and cultural historian, whose first foray into film history this is. 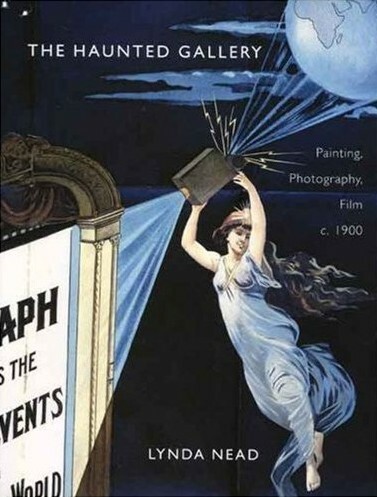 Although the subtitle implies equal coverage of painting and photography, the motion picture takes centre stage, but is set into new and exciting contexts by demonstrating its effects alongside the whole range of contemporary visual media, including painting, photography, stage magic, the magic lantern, posters and even astronomy. A space for pictures and for ghosts, the gallery is also for endless pacing watched by portraits of generations of the dead. It is a place of presences but not life, of likenesses which seem real but which are merely representations or figments of the imagination. The picture gallery is also a place of alternating light and darkness; it is a narrow apartment illuminated by shifts of light cast by unseen objects obliterating the light … How apt that the shadows cast on the ceiling by the windows and tapestried walls look like a strip of film, with intermittent, spaced-out picture frames, separated by short intervals of blank darkness. Set this sequence in motion and the enchantment begins; the pictures come to life and the ghosts haunt the gallery. Nead finds in the haunted gallery a powerful metaphor for the ‘uncanny magic’ of early film. Typically she finds multiple analogues for this concept, from Edison and Biograph advertising films of ancestors climbing down from portraits on the wall to drink Dewar’s Whisky, to similar Scottish ancestors doing much the same in Gilbert and Sullivan’s comic opera Ruddigore, to Georges Méliès’ films The Living Playing Cards and The Mysterious Portrait, to tableaux vivant, to the myth of Pygmalion and Galatea (the statue that came to life). It all interconnects. It certainly helps if you can see the pictures, and the book is richly illustrated throughout, sometimes enthralling so. Themes covered include the wheel and movement, representation of the everyday and the detective camera, the vision of mobility generated by the new-fangled motor car, the strip (the film strip, the cartoon strip and the striptease), and the astronomical imagination. This latter section looks at visions of the heavens (by way of serpentine dances, G.F. Watts, electricity and the Paris 1900 Exhibition), including some startling examples of astronomical photography spilling over into the imaginative world, represented in particular by Camille Flammarion, the French astronomer, author and astronomical filmmaker, whose 1872 novel Lumen describes all-seeing beings who view the passing of a time as a ray of light, in a constant relay of images. Metaphors, metaphors everywhere. The best image comes last – a map of the procession through London taken to mark Queen Victoria’s Diamond Jubilee on 22 June 1897 (filmed by many cameramen), marked with bright yellow explosion symbols to mark where Martian explosions occur as recorded in H.G. Wells’ The War of the Worlds, published in the same year. However, it’s not all image and metaphor, and there’s a good deal of practical understanding of the production of images (still and moving) underpinning the theoretical stuff. The moving images make sense on a practical level as well as an imaginative one. As with Jonathan Auerbach’s Body Shots, covered in a recent post, here is someone from outside the usual early film studies coterie, looking on the subject with fresh eyes and leading it into a broader cultural world, demonstrating bold analogies and connections, inviting in those from other disciplines to see how film was integral to a change in consciousness in the late-Victorian/early-Edwardian era. Both publications have enriched our field. I feel that the Bioscope may have to expand, to become just that little bit more metaphorical, if it is properly to represent its subject in its contexts. We’ll see.